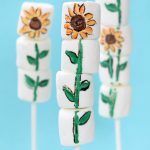 How to make sunflower marshmallow pops. 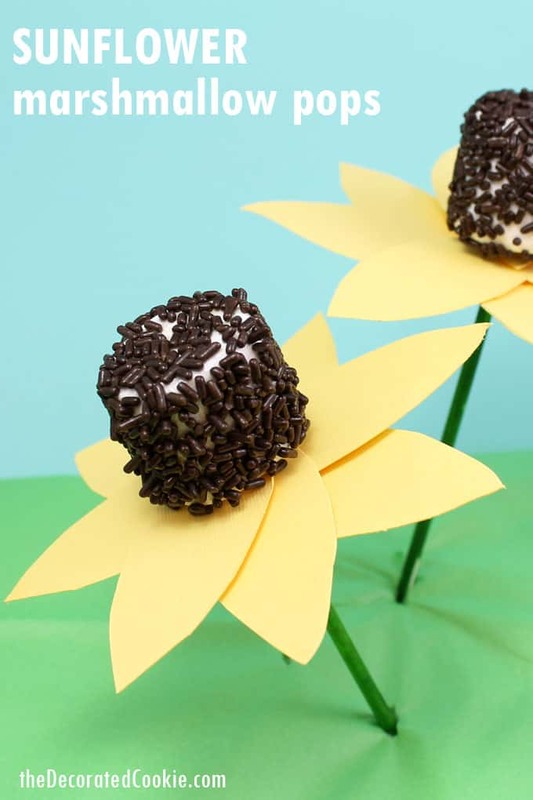 I have another version of sunflower marshmallow pops coming your way, too, so stay tuned… This idea is super similar to an idea I have in Sugarlicious (except in there I use cake pops instead of marshmallows, and add leaves, and do something a bit different with the card stock). But I’m spilling the beans here, cuz I love you that much. I made these ages and ages ago and just saved ’em, because my foresight is that good. (Though my real eyesight isn’t. You’ll always see me in glasses.) I knew my summer would be nutso, and sure enough, it is. Not only is the kiddo out of school and with me 24 hours a day, 7 days a week, and she talks incessantly, and doesn’t like to play alone, but the husband is away for Army reserves AND our house is full of dust, holes, noise, and construction workers. Also, we take sponge baths in our powder room because we’re renovating both of our real bathrooms. Nutso. Hence, a few saved posts during this crazy time. 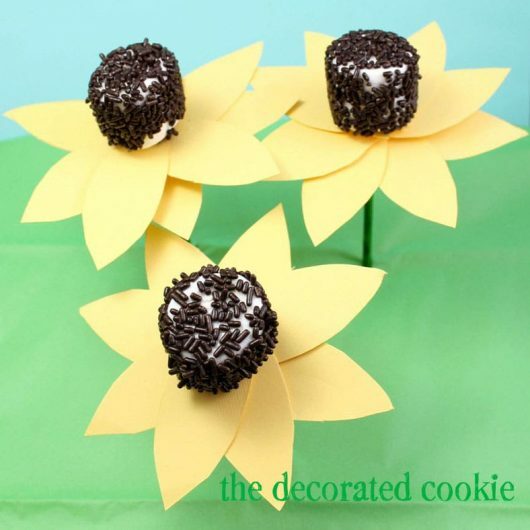 Imagine skipping barefoot through a field of marshmallow sunflower pops, sigh. Actually, that doesn’t seem wise at all if you want to eat them. Instead, maybe just make a mock field and prop these in a Styrofoam block covered with green tissue paper. *Find the lollipop sticks, jimmies, Styrofoam, food coloring, paint brush, card stock and hole punch in the craft store. The hole punch is smaller than a regular hole punch. 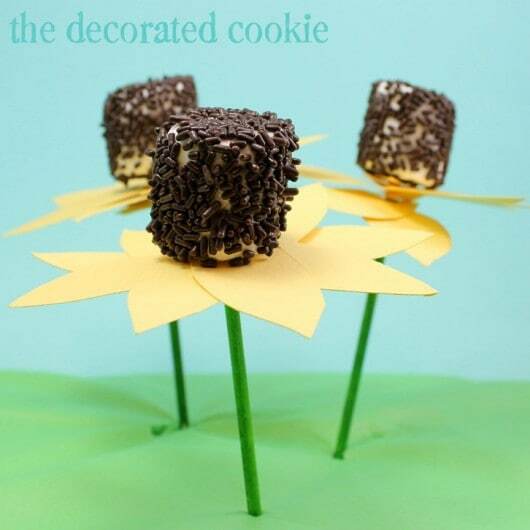 This size is slightly smaller than a lollipop stick, so the petals stay on the stick without falling, but you may also use a needle to poke a hole if you prefer. Have ready a bowl of water, a paper towel, the jimmies and an empty bowl or plate. Skewer a marshmallow with a lollipop stick, quickly dip the marshmallow into the water, trying to get as little of the stick wet as possible, dab the marshmallow on a paper towel to remove excess, hold the marshmallow over the empty bowl and sprinkle the jimmies generously over the marshmallows to coat. Prop the marshmallow in a Styrofoam block. Mix a few drops of green food coloring with a couple drops of water, using a piece of wax paper as a palette. 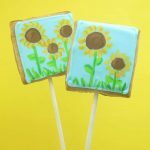 Paint the lollipop sticks and rest the pops on a piece of wax paper to dry. Cut out petal shapes from yellow card stock (I made one petal as a template). Punch a hole at one end of the petal. 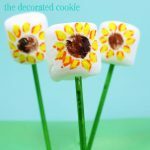 Slide a lollipop stick through the hole of a petal and push up to the marshmallow. Repeat so you have 8 petals on each flower. Please provide the template for the petal. Hi Carol. I don’t have a printed template for these. I made my own “template” to trace starting with one petal. I drew an oval with pointed ends, about 3-inches long. Then use the 1/8 inch hole punch to make holes in each. These are great. I know this post is old but maybe you can still answer? What is the youngest age group that would be able to make these? Hi Cathy! For these, I’d say any age. 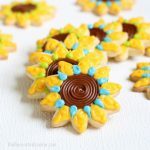 When my daughter was 2, she could do the dunking-in-water and covering in sprinkles, but she did need guidance. As long as they get instructions and a little help, anything goes. I have another version that uses food coloring pens. those, too, are good for any age, but they can stain, so I advise older kids. But sprinkles and water are great for all.